Atlanta is one of the top destinations in the South for private events like family reunions, church group outings, private conferences, celebrations, and day trips. But as the capital of Georgia, the city is notorious for some of the worst traffic in the world only comparable with the crowded city streets of Los Angeles. That’s why we make it our mission to provide each group with a professional driver who knows the roadmap of the city. With a private bus, your trip will progress smoothly as your group moves between hotels and private events. We’ll make it easy to book your bus so your private event can be seamless. Follow along with our guide to charter bus rentals in Atlanta to plan a reliable travel solution to private events in the bustling city. Families and school groups from all over Georgia head to Atlanta for its extensive network of museums and educational centers like the High Museum of Art in Midtown and the Atlanta History Center in one of Atlanta’s most vibrant neighborhoods. This urban landscape is also known for introducing many important events that have changed the course of history, such as key advancements during the American Civil Rights Movement, the 1996 Olympic Games, and a significant turning point in the American Civil War. All of these iconic events make the city well-worth visiting and exploring. However, traveling in tour groups can present a lot of travel challenges. Between rush hour traffic and crowded transit, you can’t count on Uber or Lyft to get your entire caravan to exhibits and tours. Reserve a bus to take your students, teachers, and chaperones along any route in Atlanta. Due to the city’s limited parking, it can be difficult to arrange group travel on schedule. However, when you rent a charter bus, your group can be dropped off directly in front of the museum while we handle the parking. Atlanta Charter Bus Company makes transporting groups to Atlanta’s top museums easy. When you rent a private bus for your next youth group trip, you’re saving yourself a lot of time, money, and energy. Forget hectic city traffic and expensive parking fees. Your bus rental can drop you off directly at Atlanta’s top destinations for tweens and teens, such as the World of Coca-Cola, SunTrust Park, and the Georgia Aquarium. We’ll handle all the travel and parking schedule logistics at each venue so you can focus on what’s important: having fun! With Atlanta Charter Bus Company, you can plan the ultimate youth group weekend without battling crowded public transportation stations or letting Uber surge prices chip away at your spending money. Our services make it easier for friends, families, and church groups to get to Atlanta’s most popular events in a safe, reliable, and stress-free travel method. When choosing your private bus rental you’ll want to consider which amenities you’ll need based on the number of passengers and the length of your trip. You’ll also want to consider the size of your private bus, as the comfort of the drive can make or break the event. A 25-passenger minibus rental is the ideal shuttle size for a small youth group or smaller school groups in need of transporting guests on a short trip. However, the 56-passenger charter bus is our most popular charter for large youth groups, church volunteers, or groups of field trip students due to its spaciousness, allowing for added legroom and storage space for passengers. Church members can store their equipment in the luggage bays as they travel to worship conferences as the internal storage space is expansive and adjustable. For private event trips such as private event conferences, celebrations, and group day trips, you’ll want to ensure your group is relaxed and entertained during the entirety of your trip. With amenities like TV monitors, WiFi, restrooms, and luggage bays to choose from, your bus will be outfitted with everything you’ll need for a comfortable ride. Employees can answer emails on their way to a team-building event, celebration guests can store their personal belongings on the way to the venue, and day-trippers can watch movies as they travel to popular destinations. Even day trip travel to nearby cities such as Alpharetta, Augusta, College Park, Macon, Marietta, Sandy Springs, and Savannah (the oldest city in Georgia) become hassle-free when a bus can streamline your city travels. Keep your group organized and on-time in a private shuttle. That way, Instead of dividing your group into multiple caravans, everyone can bond and relax together on the way each destination. Groups can even plan to stop at landmarks along the way between cities as a private charter bus trip is on your own time and schedule. Whatever trip you’re planning, we’ll make your group’s transportation arrangements simple. 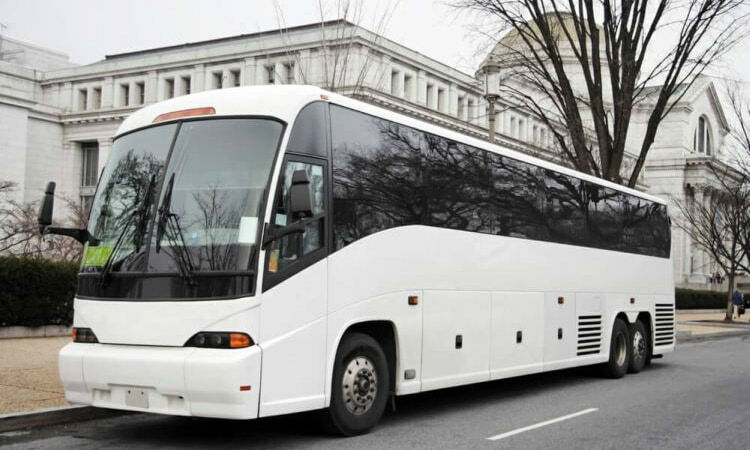 In addition to family reunions, youth group trips, and private conferences we also offer transportation for wedding parties, church attendees, sporting events, and more in the Atlanta area. Receive personalized bus travel without having to make dozens of phone calls or coordinate multiple vendors. We’ll handle everything from booking your buses to ensuring your drivers arrive on time. Call 404-474-7769 for a simplified travel solution for your next trip to the busy city of Atlanta. Atlanta Charter Bus Company has access to a wide selection of charter buses in Atlanta, Georgia and has access to more than 3,000 buses nationwide. With multiple unique buses to choose from, Atlanta Charter Bus Company can get you to and from anywhere in the U.S. at a competitive rate. Our reservation staff is available all day, every day to answer any questions about Atlanta and bus travel that you may have before booking. If you like what you see, we’ll secure your reservation in minutes, while assuring you get the best bus for your group travel needs. Our simple booking process and friendly reservation agents will make trip planning a smooth and enjoyable experience for all event planners involved in your travels.